One of the trends we’ve been tracking here at Top Tier is what we like to call the rise of the “Private Company IPO”. 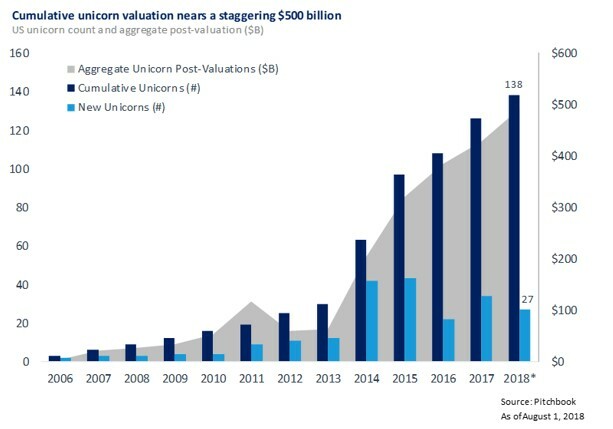 The Private Company IPO reflects the upsurge of rapidly growing “unicorn” companies with $1B+ private valuations raising increasingly large growth rounds. These rounds play a dual role: providing working capital to the company, and providing liquidity to employees. These companies are operating at large scale with 500-2000+ employees and rapidly growing year-over-year revenue figures, and are operating near or at negative free cash flow. Companies use ‘Private IPO’ capital not only to fund their business, but also to provide periodic buybacks for employees. This helps the company manage its capitalization table while helping employees to realize capital gains on their illiquid shares. We believe both these liquidity options are reminiscent of uses of proceeds for public market IPOs in the 1990s. Per PitchBook, the number of US private unicorns has increased dramatically since 2014 to over 138 as of August 2018. Throughout this same period, we see significant downturn in the number of exits closed within the private market. 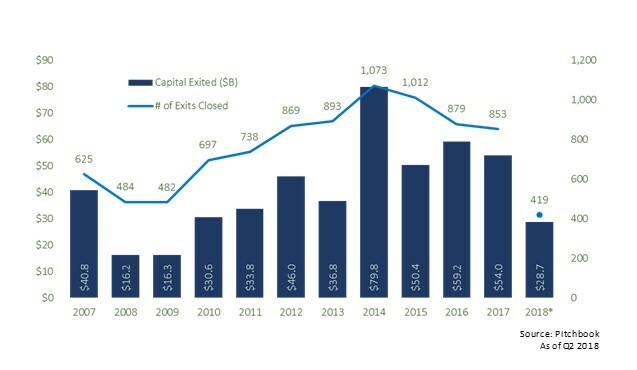 While this may be inpart due to less M&A activity, we believe the recent overall trend of large private companies raising continuous rounds of funding is fueling this decrease in overall exit opportunities. Although we’ve seen exit opportunities decrease, we believe companies staying private longer has created significant value for VC firms when it comes time for these companies to IPO. 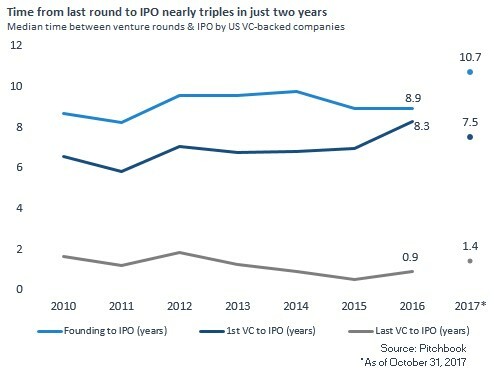 We see companies entering the public market at increasingly mature points, offering progressively stable valuations in late stage VC leading up to IPOs. The graph below illustrates this downward trend in exit opportunities and stable valuations since 2014. This phenomenon is not unique to the US. Companies around the world, especially in China, are raising previously unheard of rounds of capital. For example, Chinese ride-sharing company Didi Chuxing and mobile consumer products and services company Meituan Dianping each raised $4B in private capital in their latest funding rounds! 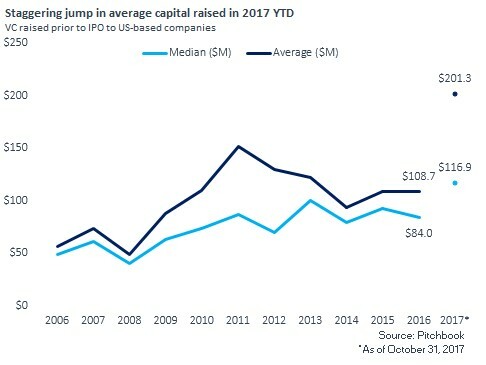 To put that in perspective, the average public US tech IPO in 2018 raised $400M, according to PitchBook. These foreign private companies are raising 10x as much capital in their late stage private rounds as public tech companies are raising in their IPOs! There are many examples of recent ‘Private IPOs’ including Lyft, Uber, and WeWork. These are substantial private companies with multi-billion dollar valuations and robust investor bases. According to Reuters, Lyft is currently in talks to sell $150M of shares in a secondary transaction at a 3% discount to the most recently disclosed valuation of $11.7B. Uber reportedly sold shares to SoftBank receiving $2B in new capital at a $68B valuation and sold $8B in secondary shares from existing investors and employees at a $48B valuation. The shared office space provider, WeWork, secured another $1B in funding from SoftBank just this past August. The Wall Street Journal notes that this recent funding has been used to create new WeWork companies and to buy back stock from existing shareholders. At Top Tier, we believe this Private Company IPO trend is here to stay. We believe factors such as increasing amounts of capital, diversified sources of capital, high regulatory and cost burdens of going public, and moderating sources of alpha in other asset classes will all contribute to this trend and fuel its longevity. As a result, we think there will be increasing amounts of Private Company IPOs, companies staying private longer, and higher private company valuations. The Private Company IPO impacts employees by allowing them to receive early liquidity for their shares that normally would be locked up until an IPO or M&A exit. Investors want access to a company’s pre-IPO to build a stake at perceived lower valuations and employees are primarily interested in liquidity. This two-sided benefit lessens the incentives for private unicorns to go public as early investors and employees have typically been the catalyst to seek public liquidity. Our research shows that this trend impacts venture capitalists by allowing early stage investors to have higher multiples on investment while later-stage investors get to capture higher IRRs closer to IPO exits. According to PitchBook, since 2010, the time to exit has increased steadily with the median time from founding to exit estimated to be 10.7 years in 2017. These companies are also raising more capital than before which is helping them to stay private longer and provide employees with liquidity. The end result is cross-over investors with larger stakes in companies that would previously need to be built up through equity purchases in the public markets. We think the biggest catalysts of Private Company IPOs are new sources of capital coming into the venture ecosystem. The most prominent example is SoftBank’s $98B Vision Fund that includes investors such as: Apple, Qualcomm, Saudi Arabia’s Public Investment Fund, and Mubadala Investment Company (the government of Abu Dhabi’s investment fund). 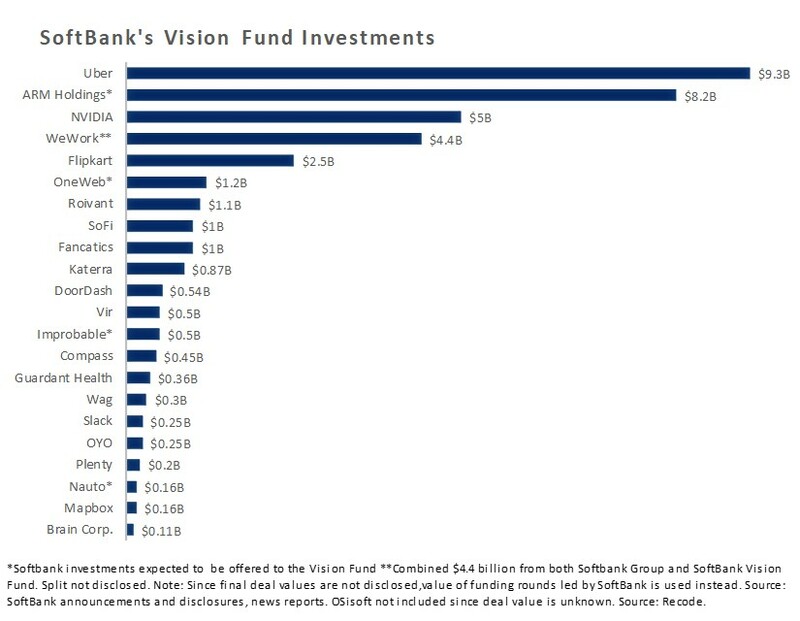 According to Crunchbase, the Vision Fund has invested nearly all of its available capital in 1.5 years. There are reports that SoftBank is planning to raise another $200B Vision Fund to invest in additional startups in the future. The chart below from Recode illustrates the companies the fund has invested in to date. As mentioned previously, the average tech IPO in 2018 raised approximately $400M. Out of the 22 investments shown above, two-thirds of them have raised greater than $400M from SoftBank alone! This large amount of capital normally cannot be fully absorbed by the company alone. At these huge dollar amounts, there is meaningful dilution that fresh capital would put upon employees and existing investors. Also, many of the management teams want to have a capital cushion for growth, but do not want to take on too much capital to that it would jeopardize the company’s incentive to pursue growth at positive unit economics. Too much capital can also influence subpar capital allocation which may affect employees and shareholders’ returns in the future. Thus, investors like the SoftBank Vision Fund are putting in new capital blended with secondary purchases to build a full ownership position. In addition to the investors above, many of our later stage venture capital managers are also accessing the secondary market to invest or increase their exposure to their best performing portfolio companies. We believe the increased number of diverse sources of capital entering the startup ecosystem will allow the best performing companies to delay IPOs and grow with private capital for longer periods of time. As shown previously, the median time to IPO for a startup is 10.7 years. However, that sample includes a group of startups that were IPO’ing early in their life due to market timing and the narrow pool of available capital. At Top Tier, we believe this trend is here to stay and is evidenced by the public market’s reception to recent tech IPOs. From Top Tier’s proprietary data, we have seen that companies are exiting with strong average revenue growth and higher average revenues than the past five years. Similarly, these companies have also been receiving higher valuations upon exit. In order to reach this large revenue scale, companies are staying private longer and focusing their efforts on executing the business rather than hiring staff to deal with public company regulations. As mentioned before, the public markets have been rewarding these companies with higher absolute and relative valuations in accordance with investor demand for high quality growth assets. The fact that many of these companies have over $100M in revenue, growing 30%+ YoY with 70%+ gross margins is attractive to public investors who foresee the growth continuing and generating large amounts of free cash flow in the future. 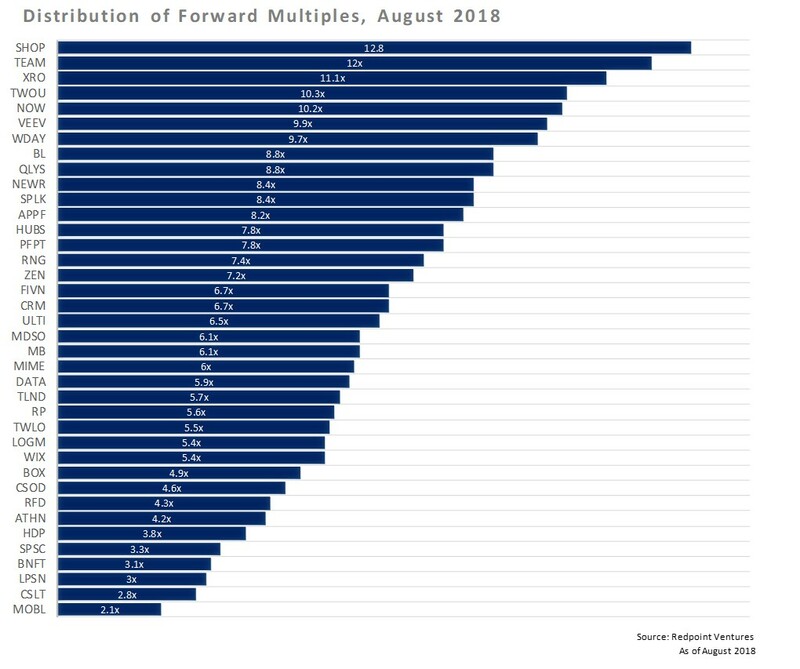 The chart below from Tomas Tunguz of Redpoint Ventures shows forward multiples for enterprise software companies as of August 2018. What should Venture investors do? We believe Private Company IPOs should be used as liquidity events similar to public company IPOs. Early stage companies with valuations over $1B would be seen as herculean outcomes within almost all VC firms. We believe VCs should use these liquidity moments to be successful exits not as a victory lap. Legging out of a private position via private financings like Private Company IPOs will benefit the company with less dilution and a manager’s investors with timely liquidity. We believe that lengthening the time to exit by holding could become the yoke that can bring down our industry’s strong performance. Investors are never reluctant to reward a successful exit. As we learned from our many years of public market activity – pigs get fat, hogs get slaughtered! The blend of larger pools of capital coming from diversified sources and looking to fund strong growth companies has created a new stage of financing: the Private Company IPO. This financing includes new capital to continue to help the business grow as well as secondary capital to provide liquidity to early investors and employees. The secondary capital in turn alleviates the inside pressure for the company to go public which further allows the company to keep growing with private capital. The benefits to the company are the avoidance of expensive fees associated with going public, the overhead and regulatory expenses involved with being a public company, and the ability to continue adding meaningful large investors who are engaged with helping the company grow to achieve an attractive liquidity event. We believe these liquidity events are important sources of exit for venture capital investments and should be used as such. We do not see this investment activity going away for the foreseeable future.